Offering some of the most valuable 1990s inserts and parallels, 1997-98 Skybox E-X2001 Basketball features a unique design and popular base rookie cards for Tim Duncan and Tracy McGrady. 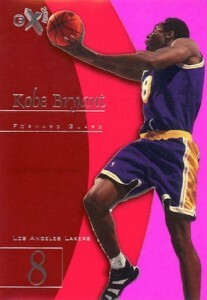 The hobby-exclusive release remains one of the most desirable basketball products of the decade. A total of 82 cards complete the base set, including two checklists. The striking base design combines acetate and foil with a die-cut player image that is main feature of the card. 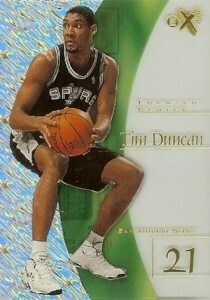 Tim Duncan, Tracy McGrady and Chauncey Billups are the top rookie card options. 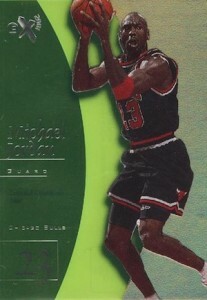 Following up on the Credentials parallels in 1996-97 E-X2000, 1997-98 Skybox E-X2001 Basketball features two different Essential Credentials options that parallel the base set. With individual card values that can push into the thousands, these limited cards have a total print run of 81 cards per player. However, that amount is split between the "Future" and "Now" versions of the set. 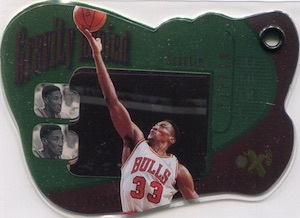 Essential Credentials Now parallels have a green color scheme and are serial numbered to the player's actual card number. 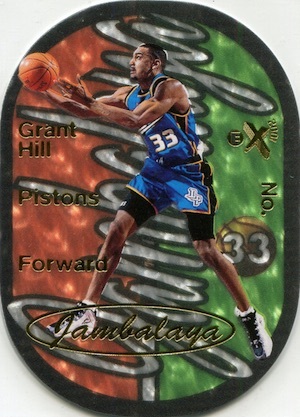 This means that card number one (Grant Hill) is numbered 1/1, card number two (Kevin Garnett) is numbered to 2, and so on up to card number 80. On the other hand, Essential Credentials Futures have a pink/purple coloring and the numbering takes the inverse. So, card number one is numbered to 80, card number two is numbered to 79, and continuing down to card number 80. The two checklists are not included in the parallel. 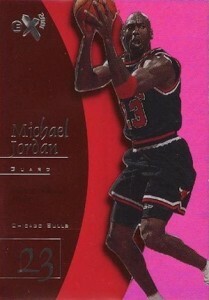 The Essential Credentials parallels alone make 1997-98 Skybox E-X2001 Basketball one of the top products of the 1990s, but the set also boasts one of the most valuable inserts of the period. Jambalaya inserts are a die-cut set that celebrates the top dunkers in the league with a playful take on the name of a Cajun dish. At 1:720 packs, or roughly one in thirty boxes, these cards are incredibly tough to pull. Two other die-cut inserts are also available, including Stardate 2001 and Gravity Denied. 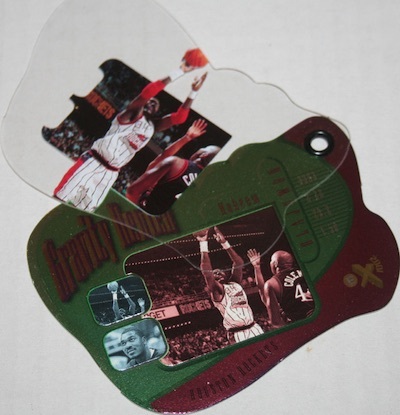 The Gravity Denied cards are notable because they have a rivet that allows for two separate images or one combined shot of the player, as seen on the Hakeem Olajuwon card below. 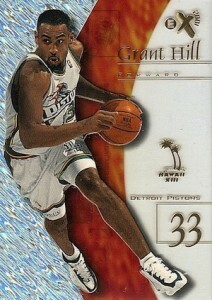 Finally, two Grant Hill sample cards can be found that were not issued in packs. They are virtually identical except the Hawaii version has a gold foil palm tree and was available at the 1998 industry convention. Given the high values associated with the product, unopened 1997-98 Skybox E-X2001 Basketball boxes are not easy to track down. Collectors should expect to pay $350-400 per box if they do locate some sealed wax. 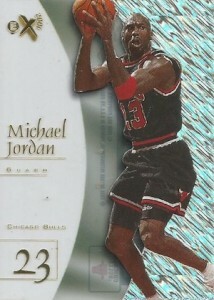 Rare 1997-98 E-x2001 Michael Jordan 3D Amazing “CUSTUM”Jambalaya # 60 ! 82 cards. Shop for complete sets. 1:60 packs. View a full guide and checklist here. 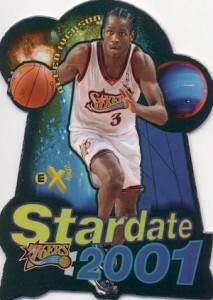 The inserts are found across multiple 1997-98 Skybox products.